Below is a selection of speeches, interviews, and op-eds in reverse chronological order. 16 May: Gisela Stuart interview in Guardian - Labour is ignoring its own voters over immigration (Guardian, 15 May 2016, link). 16 May: Boris Johnson piece - a vote for the EU is a vote for the rich and powerful who make a fortune out of the system, a vote to leave is a vote for entrepreneurs and democracy (Telegraph, 15 May 2016, link). 10 May: Iain Duncan Smith MP speech at Vote Leave HQ: the EU is a force for social injustice (Vote Leave, 10 May 2016, link). 10 May: Iain Duncan Smith MP interviewed by The Sun - Germany ‘had a de facto veto’ over Cameron’s deal, therefore no progress on welfare and immigration (The Sun, 10 May 2016, link). 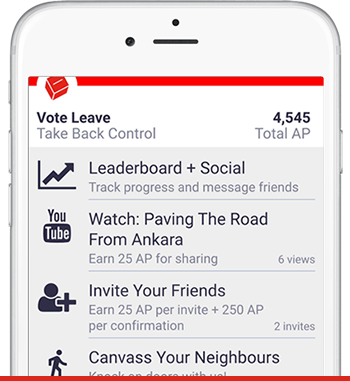 9 May: Boris Johnson MP made his first major speech (post-deal) on the EU at the Vote Leave HQ (Vote Leave, 9 May 2016, link). The Single Market has failed. The EU is undemocratic. Cameron’s deal is rubbish. Leaving is the best path to prosperity and democracy. 9 May: Priti Patel MP on the ‘huge and unsustainable pressure’ put on our schools from European migration (Telegraph, 9 May 2016, link). 8 May: Michael Gove MP interviewed on The Andrew Marr Show (available on BBC iPlayer until 7 June 2016: BBC, 8 May 2016, link; a lower quality version has been uploaded on Douglas Carswell MP’s YouTube Channel: YouTube, 9 May 2016, link). 7 May: Michael Gove MP was interviewed by ‘The Telegraph’ on security and the European Court, in which he said that a Leave vote should be followed by immediate changes to the law to stop the European Court grabbing control of our intelligence service, armed forces, and deportations (Telegraph, 7 May 2016, link). 30 April: Iain Duncan Smith MP interviewed by ‘The Sunday Telegraph’ (Sunday Telegraph, 30 April 2016, link). 27 April: James Cleverly MP - how the Common Agricultural Policy harms Africa (Vote Leave, 27 April 2016, link). 25 April: Michael Gove MP op-ed in Times - A vote to remain is a ‘direct and serious threat to the NHS’ (The Times, 25 April 2016, link). 24 April: Priti Patel MP, Sun on Sunday oped (Sun on Sunday, 24 April 2016, link). 24 April: Iain Duncan Smith MP Sunday Times (Sunday Times, 24 April 2016, link). 23 April: Iain Duncan Smith MP Daily Mail article (Daily Mail, 23 April 2016, link). 22 April: Boris Johnson MP op-ed on Obama - why America would never allow a court like the European Court to overrule its own laws (The Sun, 22 April 2016, link). 19 April: major speech by Michael Gove MP on the problems with the PM’s deal and what will happen after we vote leave (Vote Leave, 19 April 2016, link). 19 April: Michael Gove MP on Today (Vote Leave, 19 April 2016, link). 18 April: Priti Patel MP, School places (Daily Mail, 18 April 2016, link; Vote Leave, 18 April 2016, link). 10 April: Priti Patel MP interview, Sunday Express (Sunday Express, 10 April 2016, link). 6 April: David Owen MP - Brexit is necessary to protect NHS from TTIP, the proposed EU-USA deal that would give multinationals huge powers over UK public services (Guardian, 6 April 2016, link). 26 March: Wetherspoon chief says staying in EU bad for small businesses (Guardian, 26 March 2016, link). 23 March: Sir Richard Dearlove – ‘Brexit would not damage UK security’ (Prospect Magazine, 23 March 2016, link). 1 March: Norman Lamont op ed announcing he would Vote Leave. Full article not online, but we have the text (Telegraph, 1 March 2016, link). 29 February: Maj. Gen. Julian Thompson, EU bad for security, DT (Telegraph, 29 February 2016, link). 25 February: Lord Howard op ed announcing he would Vote Leave (Telegraph, 25 February 2016, link). 24 February: Lord Owen – 'EU has tested us to breaking point - it's time to leave' (The Sun, 24 February 2016, link). 24 February: Michael Gove MP interview with Laura Kuenssberg (BBC News, 24 February 2016, link). Cameron’s deal is not legally binding, the European Court is in charge of which bits stand. 23 February: George Eustice MP – Britain's farms would thrive outside of the EU (Telegraph, 23 February 2016, link). 22 February: Boris Johnson MP wrote in the Telegraph setting out his case for why to Vote Leave (Telegraph, 16 March 2016, link). 20 February: Michael Gove MP, Secretary of State for Justice, has written the following essay explaining why he is supporting Vote Leave (Vote Leave, 20 February 2016, link). 17 February: Lord Lawson – ‘Britain outside the EU would stand tall as a free and prosperous nation’ (Telegraph, 17 February 2016, link). 22 January: Interview with Dominic Cummings, Campaign Director [Economist transcript] (Vote Leave, 22 January 2016, link).